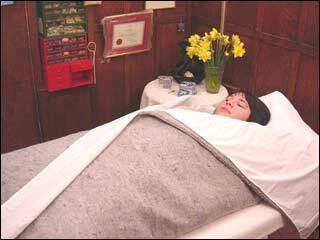 The Therapeutic Multilayer Medical Blanket is another state-of-theart therapy invented in Russia. It is made of polyurethane interwoven with shielding layers of metalized film.The Blanket is designed to shield the body from all external electromagnetic fields. It also reflects the body’s own energies back on itself to rebalance the electrical field. This safe, non-invasive therapy is used to rebalance and strengthen patients and is effective in the treatment of a wide variety of problems. Used in conjunction with Scenar therapy, The TM Blanket can correct body imbalances and can reduce dependence on prescription medicine. Case Studies: John, aged 25 He had Psoriasis on his face which caused him social problems. After 4 treatments his skin cleared up and he now has a good social life. Nancy, aged 65 Nancy's right arm was paralysed from shoulder to the fingertips. After 10 treatments all feeling returned and her doctors cancelled a scheduled operation to release the tendons to enable mobility. She can now use her arm and fingers normally. "It's so good to have the use of my arm again. I can even wind up my watch on my other hand".